The FDK 2700 Multi does not boast a CTCSS tone or even a tone burst feature for accessing 2mtr FM Repeaters. If yours happens to have this feature, you’ll be one of the lucky ones. Otherwise you’ll be keen to add this feature. This page details my efforts at fitting this feature to this rig. 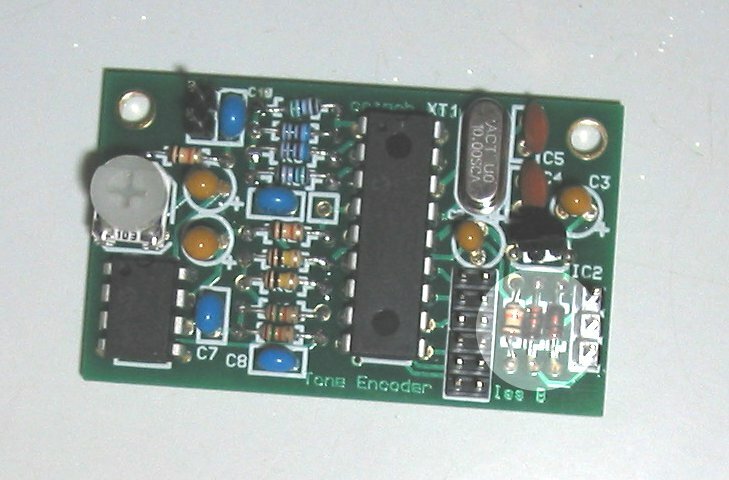 Therefore this page shows constructing a CTCSS tone board and fitting it to the FDK 2700 Multi. With no particular point to start from I choose a C S Technology Ltd CTCSS tone board kit. It was available off Ebay and hence I was able to pay easily using Paypal. The kit produces 47 different tones. For GB3SR repeater access the rig needs to generate an 88.5Hz tone. To find out what tone your repeater needs Google the repeater your interested in and you’ll find the information. As I intend to use this radio in the up coming Signals Truck the ability to change tones would be useful. The spec on this module says the tone jumpers are constantly scanned meaning you can change the tone on the fly. Medling with tiny jumpers to change the tone isn’t my idea of fun so I have plans to fit six mini toggle switches making operator tone changes a breeze. These will be detailed in the hardware assembly section. The kit arrived nicely packaged in its own plastic box within a bubble bag. Shown above the completed board. I’ve try to highlight the orientation of the two Diodes. I am mid 40’s of age. Ok, later 40’s of age and my eyesight isn’t what it was. The resistors are 1/8watt which means to me I can’t read the colour codes anymore. Component identification was greatly aided by a multimeter to measure their resistance, reading glasses and a large magnifiying glass. This should tell you that if your interested in home building electronics make sure you do it when your young as it only gets harder as you age, your eyesight declines and electronic component’s continue to get smaller. The assembly documentation is only available online as a download PDF. There is no supporting assembly instructions with the kit. No doubt this helps with the low cost of the kit, however I felt in view of this the build document could have been more comprehensive. The PCB is tiny, it would be wouldn’t it, to facilitate maximum flexibility in installation options. This leads to tiny solder pads. The chips are not socketed and the board density is high. As the assembly is aided by reference to the circuit diagram I could not recommend this kit to beginners. I’d say an intermediate construction ability would be the starting point. Diodes. Two 1N4148 diodes are used. These must to be fitted the correct way around. If the finished board fails to power up, D1 is probably the culprit where as if the PTT control line diode is incorrect the unit will seem ok but just not put out a tone. 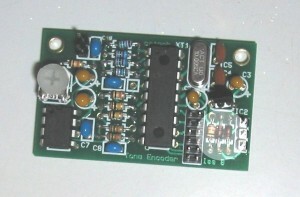 The high density component overlay does not allow the correct orientation to shown on the board. See my picture above. There is a photo of the finished board that helps in component locations, I used this to confirm the orientation of D1 and D2 from what I worked out from the circuit diagram. However the picture could have been bigger and clearer at no extra expense. Continuing this theme, a line drawing of the components placement would have helped. I kinda feel its easy to label me a blind old man but I am probably only of average demographic age in the UK with ‘average’ eyesight. There’s not much one can do about the component sizes after all, but improving the documentation just needs doing. The Capacitors caused me to think and work hard to identify their values. There are four brown ones and four blue ones. The brown ones are all of the same value, but the blues are three different values and clearly its important to have correct identification before inserting. The brown ones were Tantalum caps which are polarized, meaning these also need to be inserted the correct way around. I was unable to read the markings so turned to the internet for help. The result is the longer leg is the positive lead and there was enough space on the component overlay top side of the board to identify which hole was positive. The only difficulty was one hole but under examination with the magnifying glass I was just able to make this out in the busy overlay for C4. Any progress on the tone board for the Multi 2700?